Yesterday the Hockey Hall of Fame welcomed four new guests into this exclusive shrine. All four of these players dominated the game and had very successful careers. Surprisingly no builders, females, or officials were voted into the Hall of Fame. 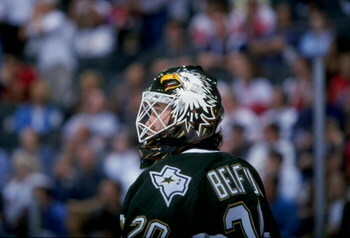 Ed Belfour was one of most dominant goaltenders of his time. He played for Chicago, Dallas, Toronto, and Florida over 19 NHL seasons. He wont the Calder Trophy, Vezina Trophy twice, and won the Stanley Cup with Dallas in 1999. Doug Gilmour played for seven teams: St. Louis, Calgary, Toronto, New Jersey, Chicago, Buffalo, and Montreal over his 20 year career. He won the Stanley Cup with Calgary in 1989 and helped Canada to the Gold at 1987 Canada Cup. He set both personal and team records in 1993 for scoring 127 points. He was also nominated for the Hart Trophy for league MVP that season. As the son of NHL legend Gordie Howe, it is hard to live up to very high standards of play, but that is exactly what Mark did. As a defenseman, he dominated every level he played including the World Hockey Association (WHA) and the National Hockey League (NHL). He played six years in the WHA before his team merged with the NHL. Mark Howe was named to the NHL First All Star team in 1983, 1986, and 1987. Joe Nieuwendyk, the current GM of the Dallas Stars, was known as one of the game’s most dominate face-off men. In his twenty year career, Joe played for Calgary, Dallas, New Jersey, Toronto, and Florida. He is one of four players all-time to have won the Stanley Cup with three different teams (Calgary in 1989, Dallas in 1999, and New Jersey in 2003) and one of the first to win a Cup in three different decades. He also won gold at the 2002 Olympic Games in Salt Lake City. This entry was posted in News, Trades, & Signings and tagged doug gilmour, ed belfour, hockey, Hockey Hall of Fame, Joe Nieuwendyk, Mark Howe, NHL. Bookmark the permalink.